Embracing the Journey – Glass Half Full with Leslie Krongold, Ed.D. A few weeks ago I attended a free resource fair in San Francisco at the Jewish Community Center. 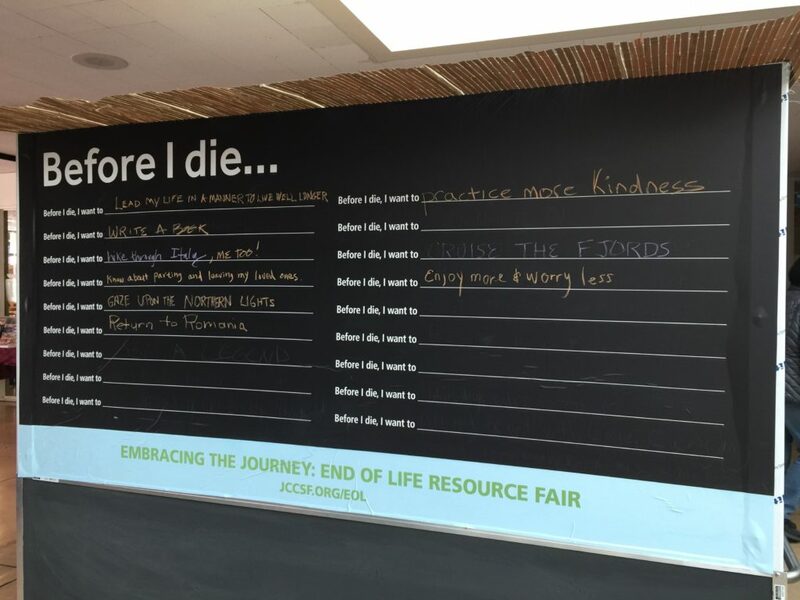 The event is called Embracing the Journey: End of Life Resource Fair. All of the resources — and panel presentations — are related to end-of-life decisions. It sounds like a real downer but it wasn’t. In fact, everyone was refreshingly friendly, inquisitive, and engaged. Unfortunately I was only able to stay for an hour and missed panel presentations covering topics such as Loving Support and Choices for Pets During Transition, Preparing Financially for the End of Life, and Your Life Story: A Labyrinth Walk of Wisdom. But I did try to make a quick visit to each vendor and pick up any available literature. There’s a great resource page with videos from some of the panel sessions. Of course you don’t have to be Jewish to attend this annual event nor to benefit from the information presented. I am interested to know if a similar resource fair exists in your community — whether it’s organized through a church group, hospital, or government entity. Please leave a comment below. I don’t know, but I’m going to look into this. Having been through end of life with parents, there’s still a lot to figure out.